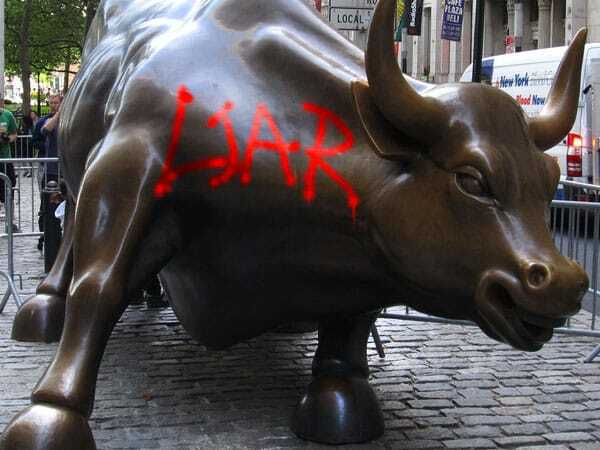 Home » This Secret Wall Street Racket Could Be the Market’s Next Big Threat – How Long Can They Keep It Up? This Secret Wall Street Racket Could Be the Market’s Next Big Threat – How Long Can They Keep It Up? Publicly traded companies release a public report of their performance once per quarter; you might have heard of this being referred to as “earnings season.” Earnings releases have a big impact on both individual companies’ stock prices and the market’s performance at large. Generally speaking, higher earnings drive stocks up, and lower earnings drive them down. However, there’s one sneaky way for companies to make their stock keep on climbing even if their business is swirling down the gutter, and it’s liable to be the catalyst for yet another economic crisis. The beginning of this rabbit hole starts with the recent earnings performance of the S&P 500. See, average earnings for all companies in the S&P 500 have dropped roughly 3.5% from where they were last year. But strangely, earnings for the index have declined for five quarters in a row. On paper, S&P earnings look exceedingly grim, and they’re forming an alarming downward trend. Yet, stocks are continuing to climb and nobody in the mainstream media seems to find this glaring discrepancy to be newsworthy. So, why this disturbing discrepancy? Wall Street has a dark secret to bolstering stocks while earnings go into freefall. Here’s why stocks keep climbing while earnings become increasingly dismal: analyst predictions. Analysts make predictions on how a company’s earnings release will look; they’re called “earnings estimates”. Analysts cover practically every publicly traded stock and make estimates for their earnings. They even do it for entire indices like the S&P 500. Here’s where it gets sticky though: a company’s earnings can be worse than ever, but stock prices will keep growing so long as the earnings are better than analysts’ estimates. The industry calls that an “earnings surprise”. Executives have all kinds of manipulations they can make within their businesses before the end of a quarter in an attempt to boost their earnings numbers and “surprise” investors. Big workforce cuts, delayed expenses, and other accounting tricks are common practice. But what if executives can’t cook the books enough to beat analysts’ earnings estimates? Simple, they start cooking the estimates too. You might be tempted to write off this sketchy behavior as just another bend in the twisted character of Wall Street, a harmless trick that never brings real harm. But professionals worry that this house of cards built on a long streak of earnings manipulation could be primed to fall soon. Paul Eitelman, investment strategist at Russell Investments, says the perplexing trend in the S&P 500 we mentioned earlier virtually never happens outside of a recession, which raises the question, are we about to plunge back into one?